All these gorgeous new stamps and stencils from Visible Image have got me rather excited!! 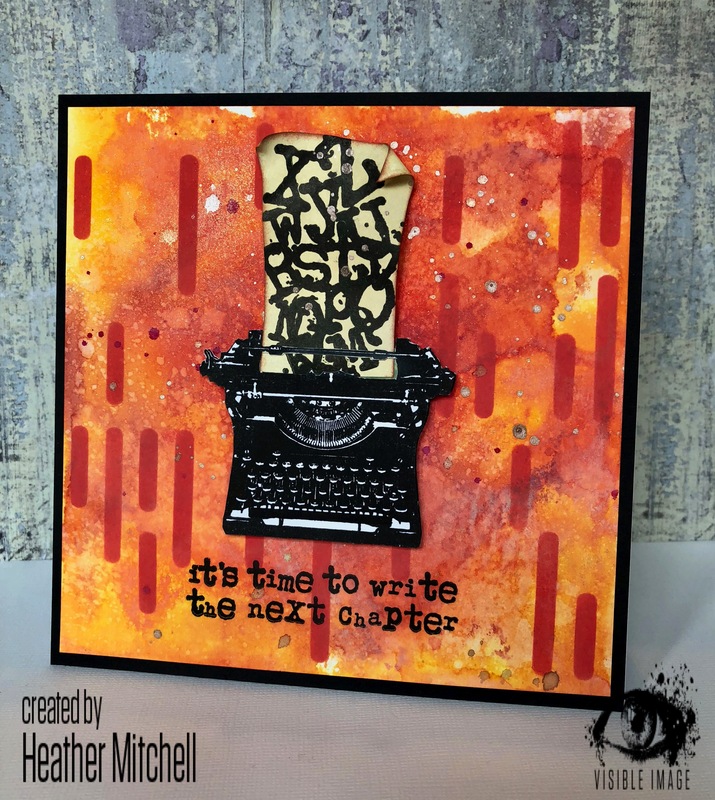 I am loving the graphic look to the stencils and know that they are going to be used loads… and the stamps? Well, Mark has pulled his designer hat out of the bag yet again and created some real beauties!! My make today uses the utterly brilliant One Kind Word stamp set and the Grateful stencil. So many possibilities with this set and I know both will become firm favourites with everyone. Really easy make this one. Create a distressed background using a mixture of Distress Ink and Distress Oxide ink pads and spritz with a shimmer spray. To add extra texture, splatter some Antique Bronze Distress Spray Stain and leave to dry. While drying, ink up the typewriter stamp and stamp twice, fussy cut them both, placing one to the side. With the other, trim around the paper and the bar bit (that holds the paper in place… which I’m sure has a proper name but I have no idea what it is!) and trim a longer piece of paper to fit in the space. Ink all over with a linen coloured ink pad and edge with dark brown. Stamp the letters and splat with the same Distress Spray Stain as before. When dry, feed the paper through the typewriter and attach some tape on the back to secure in place. Take the other stamped typewriter image and attach foam tape to the front. Secure the (now complete) other image over the top. Before adhering to the background, take the Grateful stencil and mask off various areas to give a random look. Apply red ink through the stencil and then stamp the sentiment to the bottom of the background before attaching the main image. Once in place, curl the corners for added effect and voila! Check out the gorgeous makes from the other DT members here on the Visible Image blog or in the Facebook group! We will be back this evening with some incredible inspiration from Veerle! This entry was posted in inspiring quote stamps, Our NEW stamps, Typewriter Stamp. Bookmark the permalink.